I did some research on the internet and came across a discussion in a forum about pore filling with just alcohol and pumice. 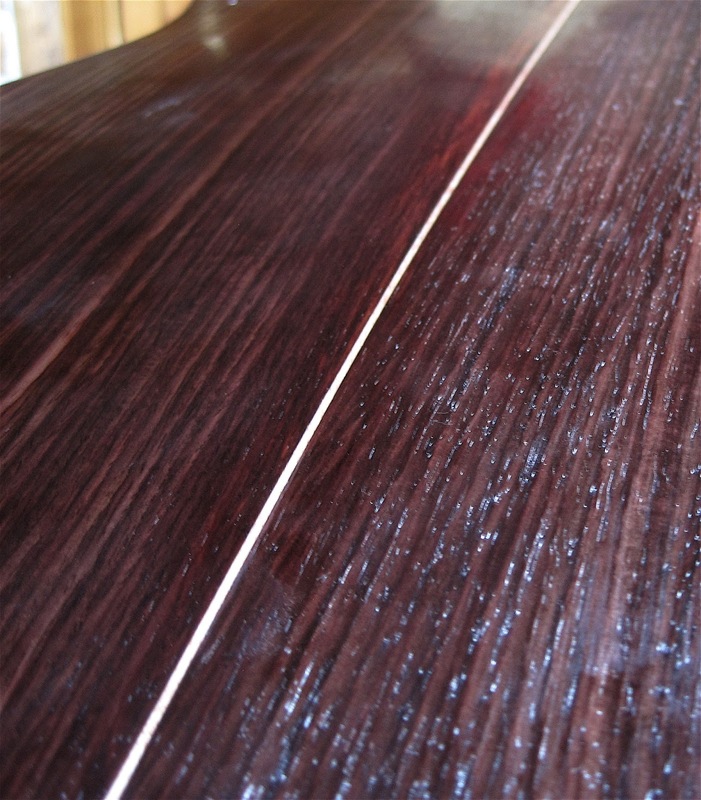 One gentleman had been a French polisher by profession and stated the using any shellac in pore filling is a waste of time. Someone else weighed in that he used a mixture of gelatin, alum and pumice to do the job. Then someone else said to apply an egg white wash, let it dry and pore fill with alcohol and pumice. 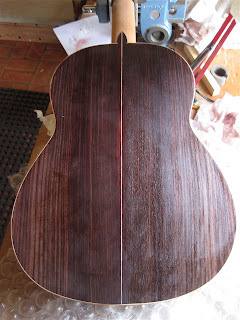 I already use an egg white wash on my guitars, it gives them a nice patina, so I thought I would try pore filling with egg white, pumice and alcohol. Take a look at the photo above, the left side of the guitar I pore filled for 30 minutes. The right side just has the dried egg white on it. Here's a close up, you can see the difference between the two halves. Yes, I will have to come back and level sand before I do another session to fill in any stray pores, but this technique is much faster than the other ones that I have used. Like twice as fast. Another great learning experience has begun! the pore filling, I do it with shellac and diatomaceous earth. Take a sheet of rough linen then a sheet of fine scrim and fill in pure sheep wool. Drop shellac into the wool and with the scrim make a bag of wool. If the bag is dampish, put the bag into the diatomaceous earth. The bag gets a linen layer and with this bag you can make the filling. Thanks for the tip, Uwe!